Well, I am proud to say that my Mary Kay Debut last weekend was a big HIT!!! I made much more money than I ever expected in one day. It was a great feeling. Now I just hope I can keep it up. The boys start school tomorrow so we will be off to an early start. We have to walk both of them to their classes for the first few days of school so they can find their way by themselves on Monday. I am excited for them to go because they are getting really bored now. Carter is starting Kindergarten and Blake is starting Second grade. Charlie is starting to use her leg now without having the surgery so hopefully we won't have to do that. She wouldn't be using her leg if it were out of place but I am a little worried about it staying in place but maybe it just took her extra time since she got so sick and lost a lot of muscle in that leg. Thank you so much for your prayers because I don't know if we could afford to pay much more for her leg. So this is an answer to our prayers for sure. Oh, I start school next week so please pray for me as I take on yet another journey. That is about it, just a little update. Charlie..... She is back to her old self thank goodness. We took her to the vet yesterday and she has a severe bacterial infection and they pumped her full of steriods and antibiotics and sent some home for like 3 weeks but she is much...much better even after one day. I also go set up to take credit cards just incase you are interested. 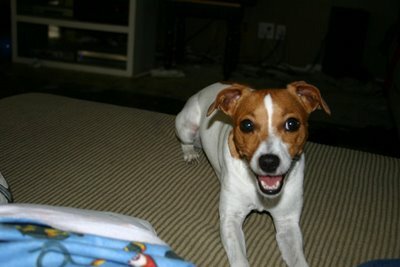 Charlie is our 5 year old Jack Russell Terrier and we have had her since she was a puppy. We love her and she is a big part of our family. She got hit by a car about 3-4 weeks ago and it must have just knicked her because it didn't brake any bones but it knocked her left back hip out of place. She has had a split on her leg for the past 3 weeks and it had to be taken off last Thursday because it was cutting into the bend of her leg and if it hadn't done its job by now then it wasn't going to. So it didn't do what we were hoping it would so now we are looking at an FHO surgery, which in a nutshell, cuts off the ball of the hip so it can't pop out of place anymore and the muscles and scar tissue fill in the area where the ball was and in about 3 months they are usually back to normal with a possible slight limp. Easy enough, Right? Well, now within the past few days of this weekend she had started losing her hair on her nose, ears, legs, and has welps all over her body. Her muscle in her hurt leg that was in a splint for so long is severly atrophied and she won't hardly eat or drink anything. So now before we even think about doing the surgery we will have to get her feeling better. I am just really worried about her she seems really depressed and won't hardly get off the couch. She doesn't go outside unless we carry her out there. This is just not normal behavior at all for a Jack Russell. Please just pray that she gets better soon and it will be fairly inexpensive because we have already spent a small fortune on her and the surgery is another small fortune and we are running out of extra fortunes. Here is a pretty picture of her before she got sick.